Before I start, the Problematic Powers posts are not going to be "lol superhero physics don't work in the real world you guys." Thanks professor, I don't think we could have figured that out by the fact that there's, you know, no one in the world with superpowers. No, these powers are problematic in terms of story. The very thing that helps to make the character interesting and entertaining for the reader (besides all that "personality" and "drama" stuff) also makes them difficult to write. Near the top of the list, probably duking it out with telepathy, is super speed. I love speedsters. If I could pick any single power in all of comics, I think it would be the Flash's version of super speed. If I couldn't have that, I'd even take Quicksilver's version. A quick note: when I say "single power," I'm talking about the speed and all the accessory powers that are necessary to make it work, like enhanced reflexes, endurance, etc. A speedster, properly written, is the only character you need on a team 90% of the time. Now, that may sound like a big claim, but it's true. A friend of mine used to say that if you had Batman for planning, Superman for heavy lifting, and the Flash for everything else, you would be set for almost every crisis the Justice League is ever called upon to answer, and he was right. He might have even been underselling it, since Flash can sub in for Batman on a lot of the stuff that requires smarts, simply by dint of subjectively having entire human lifetimes to come up with a plan. I'll be talking about Flash a lot here, because he's pretty much the most powerful speedster in comics, but almost everything said here holds true for lesser speedsters as well, to a greater or lesser degree. 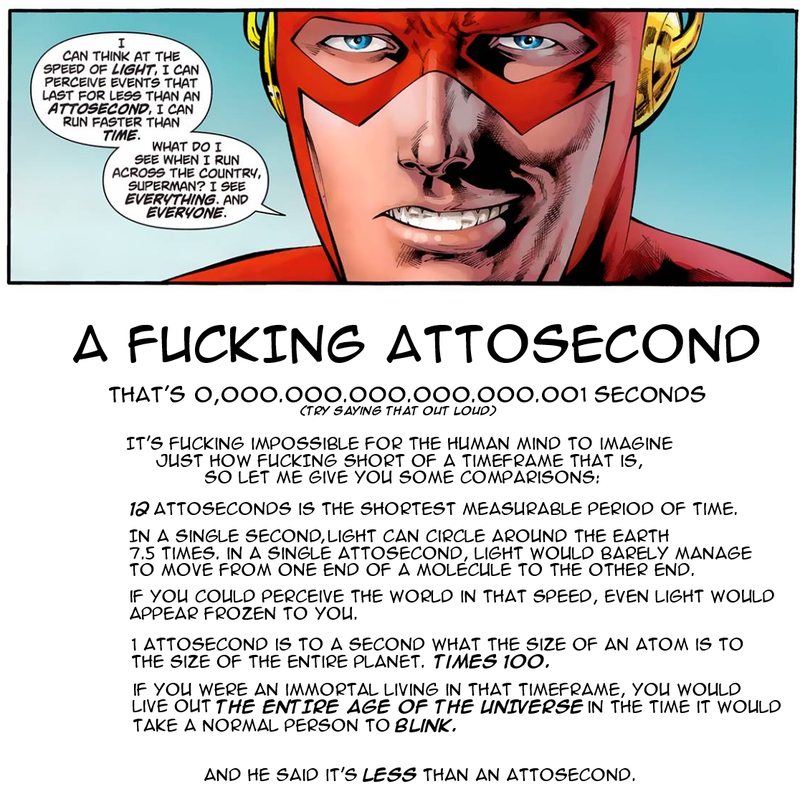 This image (NSFW language warning) lays it out pretty well: in order to be able to move at that kind of speed, with that level of reaction time, a speedster has to be thinking orders of magnitude faster than a normal human. I remember in an early issue of Peter Allen David's X-Factor run, Quicksilver learned to play the piano over the course of a minute or so, by ear, simply by getting all of the practice he needed to in that time. In a mid-90s Flash story, he read an entire law library in the time it took someone to finish a sentence. These are treated as almost parlor tricks, but it means that when writing for a speedster, anything involving reaction time or laborious time usage is off limits most of the time, at least if the character is being written as competent. And that's before you consider all of the other peripheral speedster powers. 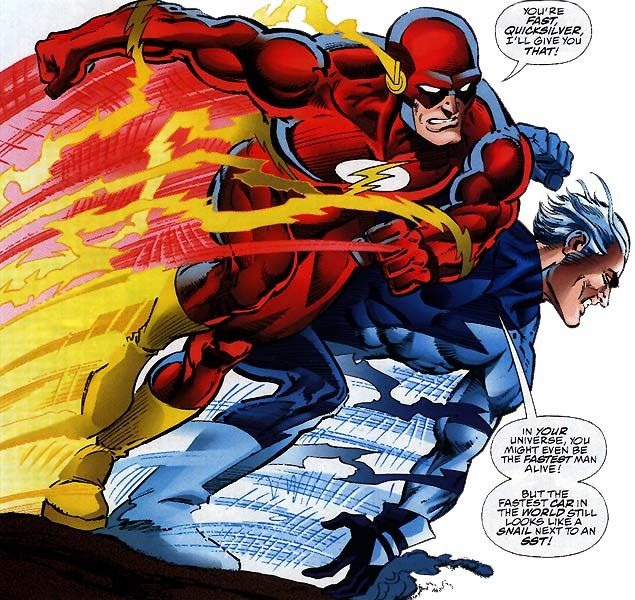 Not every one of them has these type of powers, but Flash, for example, can vibrate his molecules fast enough to pass through walls, run up walls and across water, create localized whirlwinds and updrafts to lower falling items or raise ones that are on the ground, manipulate others' kinetic energy, throw objects at near-relativistic speeds, and even travel through time or across dimensions when using his cosmic treadmill. There are a lot of great speedster stories out there, but many of them require that the character takes it down a notch. On team books, especially, the speedster often has to be either ignored, knocked out, or in some way occupied to keep from breaking the narrative; this happened fairly often on the Justice League cartoon, according to one of the writers, simply because it was too hard to make a legitimate challenge for the Flash. When you read a team book that has a speedster in it, keep an eye on that character. You can get a good handle on how well the writer can work with superheroes by seeing how he manages the speedster.